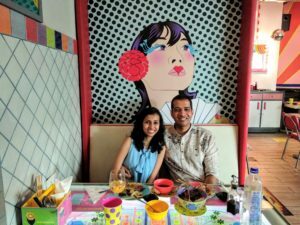 We are a nerdy couple from Mumbai, India who love travelling to new places and writing about our adventures together. We also enjoy playing video games and geeking out on TV shows and movies. We started blogging in early 2016. We had just gotten married and had reserved the domain mainly to serve as a ‘Save the Date’ website. Once the wedding was over, we didn’t want the domain to fall into disuse and therefore decided to start writing about our adventures together as a married couple. Over time, we figured that travel is something that the two of us are extremely fond of and started refocusing the blog primarily towards boutique luxury travel and offbeat experiences. Most of our writing is inspired from places we’ve visited. Visiting a new destination allows us to tick items off our ever-growing bucket list and we get excited to tell the world about it. The blog is simply our mouthpiece. Occasionally, we also write about geeky things we enjoy like Harry Potter or Game of Thrones. Growing your following to a decent size takes time; a lot of time. So our advice for people who are just starting out is to be patient. Ensure that you generate good quality content on a regular basis and try and interact with your followers as much as you can. Success will follow. The blogging industry has grown a lot and is focusing more on niches than generic topics. Social media is always evolving and that influences content sharing a lot. We use WordPress as our blogging platform, Buffer to schedule posts on Twitter and Facebook, IFTTT for automating tasks, and Canva for image creation. One of our posts on the Game of Thrones castle Greywater Watch went viral on reddit. Consequently, we received a few thousand page views in a matter of hours. This happened in the early days of our blog so we were quite thrilled to get this unexpected source of visitors. We would like to establish our site as one of the go-to resources for people looking for boutique luxury travel advice. We would also like to see active discussion on our blog posts and create a community of like-minded people.